Monica of Turn- U -Off, Kak Kujie of Hidup Biar Sedap and Nessa of Nessa Mumblings. I Would also like to thank few people (first time commenting here in RestNrilekS) for taking some time writing down their thoughts...Much Appreciated : ) Thanks to MaxisVelasco of OvahCoffee, Thomas of artbythomas and GreenLava of BloggerSentral. This entry will be sort of like a Rojak. There will be no Rafiqin : the boy who made such a bruhaha over the death of Din Beramboi on the FaceBook (Al-Fatihah : moga rohnya dicucuri rahmat), no Kesatria Poyos : which is a game on Facebook much like Mafia Wars developed by a Malaysian (syabas dan Tahniah Atok!!) , nor will this post be about the Negeri Sembilan which won the FA 2010 Championship. This is definitely a Rojak Post : But Rojak can be delicious. Haha. (Wikipedia) Rojak is a traditional fuit and vegetable salad dish commonly found in Malaysia, Singapore and Indonesia. The term Rojak is Malay for mixture. 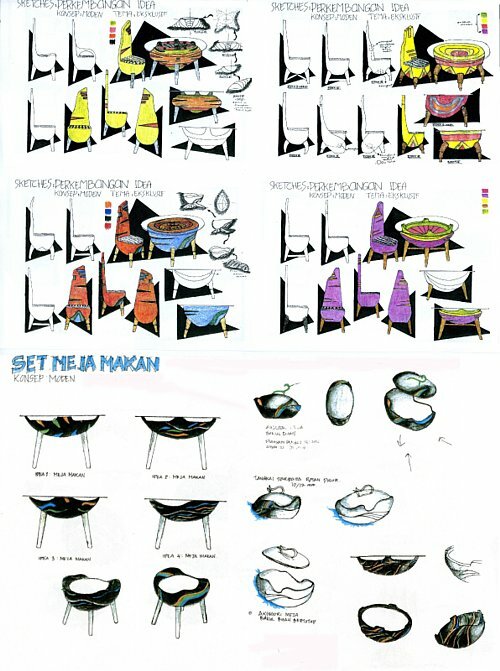 Orait, it has been indeed a while since my last post, and i feel like i havent posted anything much related to arts and crafts topics here in RestNrilekS. Thus, i am starting this post by saying, THANK YOU to Yoon See of Greener Pasture for awarding me with this award. Terima Kasih Terima Kasih. Yoon See is a blogger who blogs about arts and crafts. She is a full time coach teaching piano, art and tuition. Greener Pasture is a place for her to share her life experiences and art creations with "Maverick Cpririts!"
. Do you remember this sketch in my previous post? 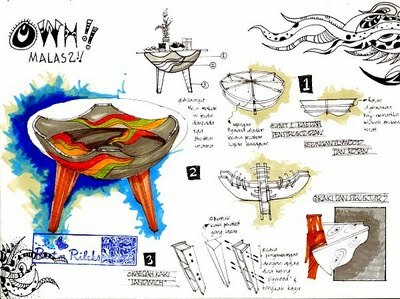 This is my resketch (design documentation purpose) of my student design of rattan handmade table for two. Above are jus few of the design ideas while developing the handmade rattan furniture. I decided to go with black as main color ditching the so called bright neon colors look alike. 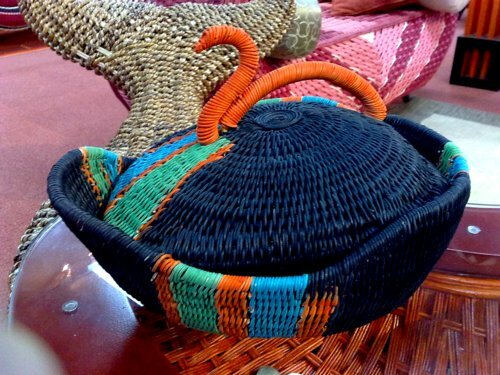 And here is a Handmade Rattan Bowl of Coiling Technique : A Swan Inspired. Ta Daa. Just a simple design weaving pattern of strips. Actually it is a different technique than that of coiling. A bit of Coiling in RestNrilekS can be read here and here. I hope to post more rattan design ideas and the finished handmade rattan products in the future. Coiling ? Here is another one that has moved to a new owner : Kak Emila Yusof : A self thought artist and illustrator. 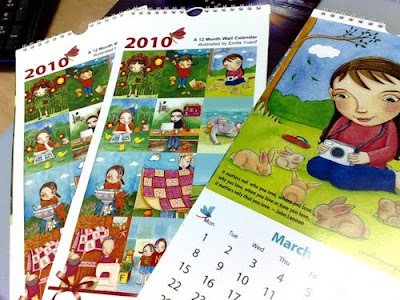 Speaking of Kak Emi, she gave me three of her illustrated calenders when we met on 1st Mac that day. In fact, she has given me some of her awesome creative artworks. Terima Kasih Kak Emi. Now only i remember that over my course of blogging, i ve only met two bloggers so far. One is Manggo of KulitManggis : the much talented in handmade rubber handcarved stamps, and the other one is Kak Emila. I wonder if i ll be able to meet other bloggers too. Last but not least on the Arts and Craft issue, i was reviewed on February by Syia Lynn of The Artsy Crafty. Thanks Syia for the February Feature. Hope on to her blog to show some love. 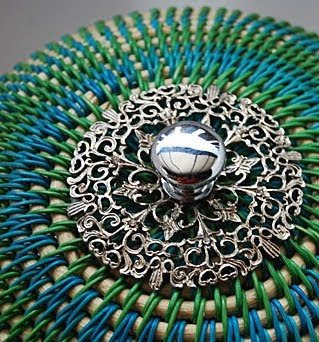 It is great that while blogwalking, i ve stumbled upon more and more arts and crafts Malaysian blogs. Recapping my previous post, What is my take on the "Blogging is No Longer Fun" issue? I will leave that for my future posts. Thank You for all who have commented and giving insights. Really Appreciate!! Though i havent fully found my blogging mojojo, i am far better shape than in my previous conditions. I think part of me feeling depressed that day was due to problems in my life too. I ve also realized that my greatest strentgh is also my greates weakness, thus i ve got to find ways to keep them in balance. Or else, i ll be consumed with hatred. tsk!! tsk!! tsk!! 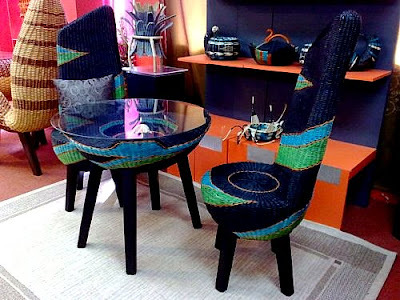 love the rattan seat for two :) the colors are vibrant :D sea like... the set will look pretty cute in a corner of someone's house one day :D u have pretty talented students there.. chaiyooooooooooo! Have a great week Rizal. <span><span><span><span>Rafiqin : the boy who made such a bruhaha over the death of Din Beramboi on the FaceBook </span></span></span></span> *DONT_KNOW* *DONT_KNOW* *DONT_KNOW* *DONT_KNOW* what's the story RIzal? I dunno but mcm menarik je. *DONT_KNOW* *DONT_KNOW* . Terima Kasih Nessa, memang patutnya cermin tu lagi besar, tapi sebab kesuntukan masa, kira pakai cermin mana yang ada. Ahaks.. kalau google memang banyak nama dia keluar. Dia kutuk Alyarham Din Beramboi dalam Wall FB dia..
Masalahnya budak 14tahun.. glamer cara negatif..
Kalau guna google insight - dalam malaysia nama dia antara pencarian tertinggi..
Good luck with your final year presentation. yes, less on the hatred more on the loving. terimakasih dgn 'sweet compliment' tu... jgn lebih2 nnt kencing manis. Salam Kak Jie.. mekasih tandang. Tu la, semenjak red karpet, lepas tuu ngetop tambah sibuk nak pilihan raya ni.. Kak Jie makin sibuk tapi maintain ayu. Hehe. taktik menjadi tu... :) , no satu untuk "no rafiqin"
Ahaks, tuu laaa tak sangka. Nasib baik hang bagitau. Syiok memang syiok tapi ntah.. mungkin ni kali pertama atau kedua ketiga akan amalkan..